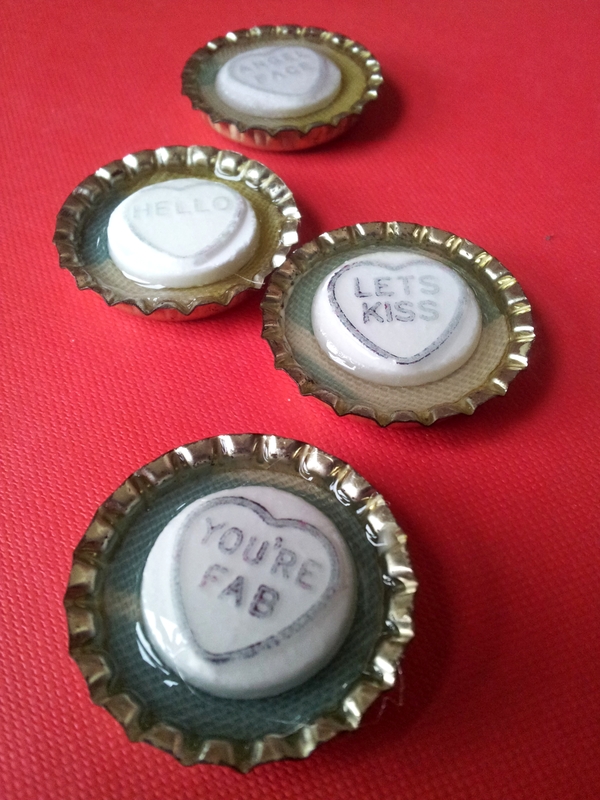 I may be slightly addicted to making Bottletop Magnets. There is something so satisfying about such a tiny little canvas, using up something that would ordinarily go in the bin, and experimenting with what works with resin. These may be my favourites so far…. I am not an especially big fan of Valentines Day, y’know, commercialism, guilts, singles feeling rubbish etc etc. But I DO love an excuse for crafting. Tim and I had begun a long distance relationship about a month before Valentines Day 7 years ago. It was a little opportunity to show each other just how head over heels we already were. I was on a bit of a candle making buzz around that time, I used to experiment with all sorts- old keys, flowers, flax. I poured my heart and soul into a big candle for Tim, using a few different kinds of New Zealand foliage. I sent it up to him, hundreds of miles away, in perfect time and he told me just how much he loved it. It was only a few months later that he revealed how he lit it at the dining table (he LIT it?? Who LIGHTS candles??!) whilst sitting down for dinner with his whole family…. and it, um, caught fire. Foliage + candles = hazard. His family must have thought me a bit daft. Anyway, I know you are wondering how he could have competed with such a WONDERFUL pressie from me… Well! He blew my amazing, slightly perilous, candle out of the water. I returned home from university that Valentines Day to a box of chickens on my doorstep. Live chickens. A pair of chooks called Miranda and Gertrude he had adopted on my behalf. We got engaged the very next month…. 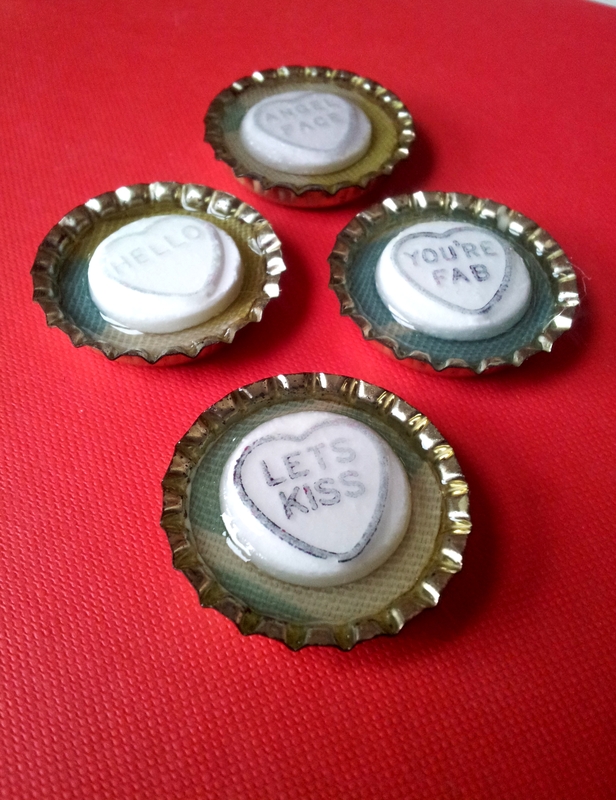 So here is another batch of bottletop magnets from me and seeing as there is only 1 month to go let’s make it a loved up Valentines Day special…. Collect your bottletops – the ones I am using here were picked up from a bar so have their edges pressed out from the auto-bottletop popper which is quite a nice effect, but it looks fine without too. Stick magnets on the back- I buy ugly magnets from secondhand shops and re-use those! I used these Loveheart sweets and am stoked with how they look- I did try other colours but only the white ones managed to hold their colours, so be warned. 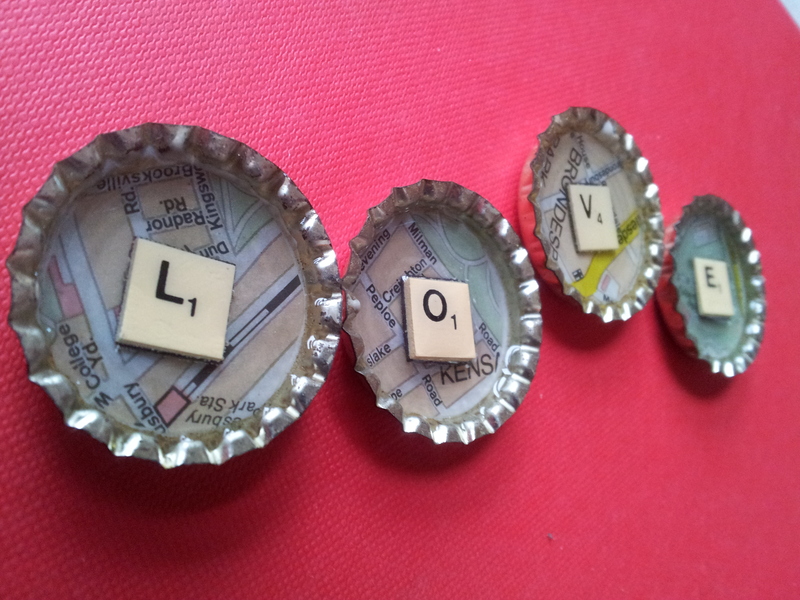 I also cut up a map and placed small (from a travel Scrabble set) letters inside. I like the idea of using segments of maps from places that mean something to you both- where you met, first kiss and all that gushy stuff! And, Gosh, I LOVE Scrabble letters, these mini ones work a dream. Are you already thinking about Valentines Day? Have anything planned? Wilkos also sell the bottle tops in the home brewing section and they are super cheap! I make little works of art out of them. But that is a good idea! We had them for a couple of years, until it was time to come here to England. They were awesome, free range, lived on my scraps- mostly crisps and muffins haha!